Some of you may be aware that this Thursday will bring strikes and rallies in 100 American Cities. 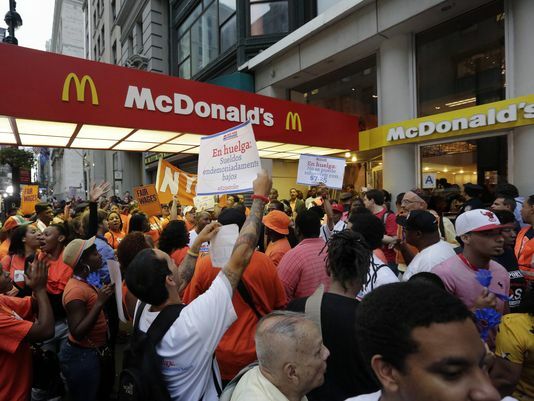 These strikes and rallies will be held in and near fast food restaurants across the country. The strikers will be rallying in support of a living wage for fast food employees. Presently, the average fast food worker earns between $8-9 dollars per hour. This is significantly below the official poverty level in the United States. The strikers seek a minimum wage of $15 per hour ($30,000 per year assuming a 40 hour work week) and the right to organize. This is an issue that is seemingly gaining steam. While there is no traction for a minimum wage increase at the federal level (Congress likely wouldn’t vote on observing Christmas if it was put to a vote), there are a number of states that have either passed laws for higher minimum wage or are debating them at this time. Additionally, there seems to be increasing support from a diverse group of interests in finding a way to mitigate inequality. A number of economists including Joseph Stiglitz, Robert Reich, and Jeffrey Sachs have come out in support of raising the minimum wage as a way to create greater equality. They noted that the minimum wage has declined in real dollar terms from $12 to $7.25 in the past 45 years. Most interesting is the recent statement from Pope Francis Evangelii Gaudium, a manifesto for the renewal of the church. In the document the Pope decries trickle down economics and inequality. Of course, the other side is in an uproar. In addition to some of the usual suspects (Fox News, Rush Limbaugh) branding the Pope a Marxist or a Socialist, there is real concern among the business community around the possibility that their labor costs may increase. They realize correctly, that if the movement gets traction in the fast food sector and in some of the higher population stats that there will be a defacto national increase in the minimum wage regardless of the federal governments inaction. Walmart and other retailers are more than a bit interested in what happens this week. 1) Businesses have no pricing power and would have to fully absorb the increased cost of labor. If we assume that this isn’t true (if you have been to the supermarket lately you know this isn’t true) then we understand that business will likely pass some of the increased cost along to everyone. This is especially true if ALL businesses are impacted by the increase in labor cost. 2) That there is a one for one relationship between labor costs and total costs. Again a fallacy. McDonalds labor costs are approximately 20% of revenue. Walmart’s are much lower, say 2-3%. So again, the cost of a Big Mac wouldn’t double. It would increase somewhat but by less than one initially assumes. 3) Large retailers and fast food restaurants can make significant cuts in labor and still serve their customers. Have you been to a McD’s or a Walmart recently??? Yes, I am sure that over time there will be continued technological innovation that will reduce the units of human capital needed to produce a unit of product. I don’t think that an increase in minimum wage will materially change the pace of innovation and I am certain that if Walmart uses any less labor we will all be able to “shop” there for free. 4) None of the increased money paid in labor will be spent in the stores/restaurants that pay the labor. Even Henry Ford understood that paying workers a living wage was good because they then bought stuff that you produced. Not to mention that turnover would decrease and worker satisfaction would be better. It shouldn’t shock any one that minimum wage workers are significant customers of fast food restaurants and big box retailers. Its likely that these entities would capture a significant amount of the increased money available to minimum wage workers in the form of increased sales. Now there is a another point. At present, there are significant social service transfers (EITC, food stamps, housing credits) to the working poor. These people aren’t the welfare mothers of Ronald Reagan. They are people who work hard in jobs that don’t pay well. We may not like the fact that some of our taxes go to support the working poor but I suspect that most of us would like the results of not supporting them even less. It’s important to note that these government subsidies are not just a transfer of wealth to poor people. They are a direct subsidy to large for profit entities in the form of wage subsidies that allow them to pay less. Also, these wage subsidies get spent in their businesses. Now, I’m not sure which is more economically efficient higher minimum wages or government assistance, but subsidizing both poor people and corporates is essentially two government transfers and we all know how inefficient the government is. Wouldn’t it just be better to force business to pay a living wage and have them allocate their costs accordingly? All I ask is that on Thursday you consider the state of minimum wage workers and avoid fast food restaurants and large retailers. It won’t be all that difficult and if enough of us act it will send a message to businesses to do the right thing. This entry was posted in Uncategorized and tagged Jeffrey Sachs, Living wage, McDonald, Minimum wage, Robert Reich, Ronald Reagan, United States, Walmart on December 3, 2013 by kushnerjr.